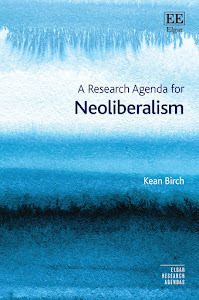 From its initial conceptualization in Mont Pelerin in 1947, neoliberalism has now become a ubiquitous term in geography, and elsewhere; it is used to theorize everything from the development of ecosystem services through urban regeneration to financialization (Springer, Birch & MacLeavy 2016). Across a range of disciplines it is conceptualized in various ways as, for example, a geographical process; a form of governmentality; the restoration of elite class power; a discourse; a political project of institutional change; a set of transformative ideas; a development policy paradigm; a radical political slogan; an epistemic community or thought collective; an economic ideology or doctrine; a particular form of violence; and so on. Such variety and diversity in intellectual analysis (i.e. an explanatory framework) and substantive topic (i.e. a thing to explain) have produced a glut of concepts, theories, and analyses. While this medley might be seen as a necessary – and fruitful – outcome of such a hybrid and heterogeneous process, it also has the potential side-effect of leaving us more confused than enlightened. It is increasingly difficult, on the one hand, to parse or synthesize this intellectual (yet often contradictory) abundance and, on the other hand, to apply it to policy or practical issues facing diverse communities, societies, organizations and individuals around the world. It also risk becoming a self-fulfilling prophecy, where despite our hesitancies, we come to believe that there really is no alternative. A body of literature is emerging that is critical of current conceptions and understandings of neoliberalism, highlighting these issues (e.g. Boas & Gans-Morse 2009; Barnett 2009; Weller and O’Neill 2014; Flew 2014; Birch 2015; Venugopal 2015). If you would like to participate in the session, please submit an abstract (250 words max) by 19 October 2015 to both kean@yorku.ca and springer@uvic.ca. If you would like to participate in other ways (e.g. discussant) then please feel free to contact us as well.